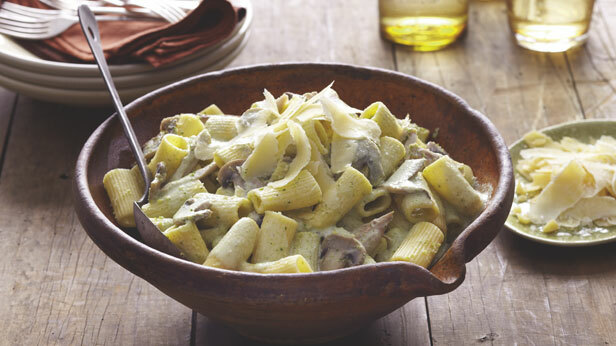 375g (12oz) rigatoni or other tubular pasta 150ml (5fl oz) dry white wine 1 small onion, finely chopped 500g (1lb) mixed wild or cultivated mushrooms, such as shiitake, oyster, ceps, coarsely sliced salt and black pepper 6tbsp double cream 4tbsp good-quality pesto ( ready made or see box, below) 60g (2oz) rocket leaves, roughly chopped coarsely grated parmesan cheese, to serve . Purèe 60g (2oz) grated parmesan cheese, 1 garlic clove, 60g (2oz) pine nuts, 60g (2oz) fresh basil leaves, and salt and pepper to taste in a food processor until almost smooth. Add 4tbsp olive oil gradually, with the blades turning, scraping the side of the bowl occasionally with a rubber spatula to mixture is incorporated. 1- Cook the pasta in boiling salted water according to packet instructions until just tender. 2- Meanwhile, pour the wine into a large frying pan, add the onion and cook over a low heat until the onion has softened, about 10-15 minutes. Add the mushrooms and stir over a high heat for a few minutes until the mushrooms are cooked and the liquid has reduced ( there should be about 2 tablespoons left ). Season with salt pepper, add the cream and pesto, and stir to mix. 3- Drain the pasta and add to the mushroom mixture in the pan. Check the seasoning. At the last moment, stir in the rocket leaves and allow to wilt for about 2 minutes. Serve immediately, scattered with parmesan. The warm, peppery, pungent taste of rocket is one people love or hate. If you love it and you’re making your own pesto for this dish, try substituting rocket for basil in the pesto recipe left.